The perfect gift for your friends and your family! Choose from our catalogue of outdoor activities near Montpellier in the Hérault, Gard, Lozère, Cévennes and Occitanie region. We believe that the perfect gift is unique to each individual and that it can be given for many reasons and occasions. This is why we want to make it unforgettable. 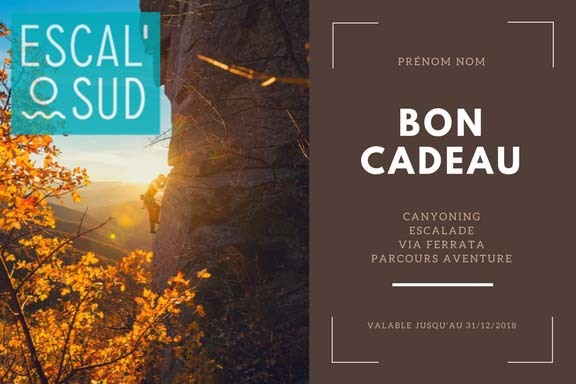 The gift card is personalised to the beneficiary and is valid for 1 year on all the activities like Canyoning, Climbing, Via Ferrata and Hiking & Abseiling proposed by Escal’OSud. You can even offer multiple activities if you want to. Receive the gift card by e-mail and the beneficiary can contact us (15 days minimum prior to the activity) to make a reservation and enjoy your gift. If you want to treat someone a gift, ask a question or get more information on our activities, you can contact us by calling us at +33 7 83 82 61 22 or by writing a message using the contact form below.